You know the expression “There’s no use crying over spilled milk”? Well, the eight-year-old version of me never got the memo. It was around that time in my life when a glass of perfectly good 2% milk tragically spilled all over the dark blue carpet in my room -- and I panicked. So I went into cover-up mode. I had to hide all the evidence. No one could know about this. Ever. It’s a pretty random and distant memory, but I still remember it vividly. I think one of the reasons I responded so rashly wasn’t just fear, but also shame. I was ashamed of the mistake I had made, and I think it was one of the first instances I can remember feeling that way. And definitely not the last. Shame is as painful as it is powerful. It makes us feel guilty. It fills us with regret. It makes us look for the nearest rock to duck under. It makes us feel like worthless failures, and not good for anything. And in doing so, it drives us into isolation. Shame will try to tie our past to our present by convincing you and me that our mistakes are not forgivable. Shame will try to tell you that one person’s rejection of you means you are a failure and not good enough. It was shame that drove Adam and Eve to hide from God after they disobeyed Him in the Garden of Eden. It was shame that drove Peter to withdraw and weep bitterly after denying Jesus three times right before He was crucified. But even after their mess-ups, God covered up Adam and Eve when they realized their nakedness. Jesus redeemed Peter and he went on to become one of the major players of the early Church. And God still offers that today -- He will cover your shame, too. I don’t know what it is you’re holding on to. Maybe it’s a mistake you made years ago or the hurtful words of a loved one that still echo in your head or a crushing failure that left you embarrassed. Whatever it is, the longer we hold on to it, the longer we’ll be stuck in a cycle of shame. 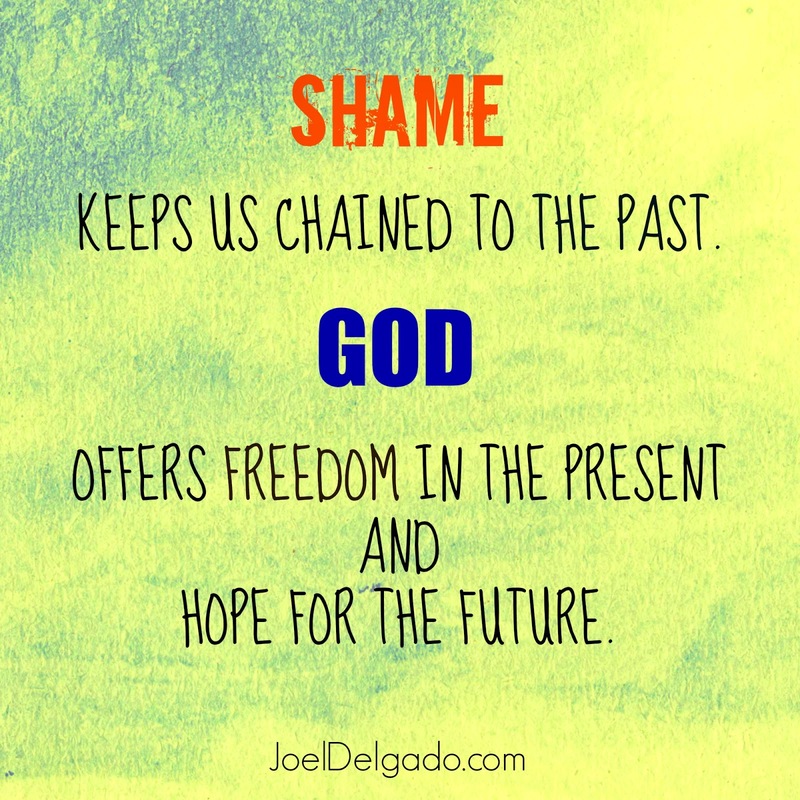 Shame keeps us chained to the past while God offers freedom in the present and hope for the future. When we bring all of our shame, all of our sin, all of our regrets, all of our guilt to God, He will toss them into depths of the sea (Micah 7:19) and they will be as far from us as the east is to the west (Psalm 103:12). And because of that, if you are a Christ follower, there is no more condemnation in Christ (Romans 8:1). It’s done, it’s over, it’s forgiven and forgotten. Still, even when shame shows up today, I’ll do what the 8-year-old version of me did -- I’ll try and hide it. I’ll try and run from it. I’ll try to avoid dealing with it. Sometimes, I’ll even believe what it says about me. At some point, we all have to decide to confront shame when it shows up in our lives. We have to bring it to God and replace shame with His truth. Then, and only then, can we move forward towards whatever He has planned for us.